This document is the manual for the IceWM X11 window manager. The IceWM manpages provide additional documentation. The goal of IceWM is to provide a small, fast and familiar window manager for the X11 window system, which is compatible with the EWMH and ICCCM window manager protocols. Generally, it tries to make all functions available both by keyboard and by mouse (this is not currently possible when using mouse focus). IceWM originally was designed to emulate the look of Motif, OS/2 Warp 4, OS/2 Warp 3 and Windows 95. Since it has a theming engine others styles are possible. A large number of original themes have been created and published by users. Further information can be found at the IceWM website, at the current site of development, which includes the support requests. IceWM and its documentation are covered by a GNU LGPL license, which is included in the distribution. icewm - The actual window manager binary. It handles window placement and draws the window decorations. icewmbg - The background setting application. It can assign plain background color or images in different formats to the X background. Either shared or separate for different workspaces. This program should be started before icewm. icewm-session - The IceWM session manager runs all of the above. This is the preferred program to start IceWM. icewm-menu-fdo - This generates IceWM program menus from FreeDesktop .desktop files. icewmhint - Is a simple utility for passing IceWM hints to IceWM by window class and instance. Icewmhint uses a special property, ‘“_ICEWM_WINOPHINT”’, on the root window to pass special hints to IceWM. icehelp - Is used by icewm to display the ‘IceWM manual’ and the manpages. See the output of icehelp --help for details. icesh - Could be used to manage IceWM internals from the command line. The icewm program alone is suitable for use with desktop environments like GNOME. 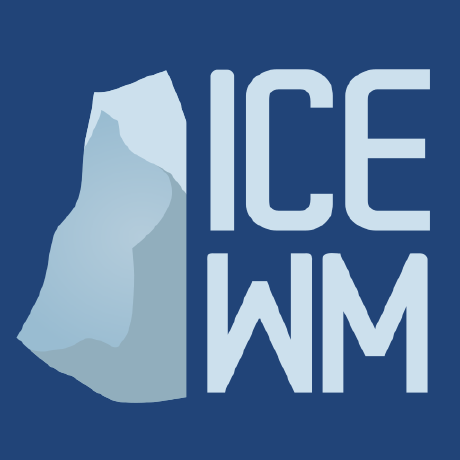 If you wish to run the whole IceWM suite (WM, background changer, Docklet support, and startup/shutdown script handling), use the icewm-session binary instead of pure icewm. Note that this is not a complete Session Manager but it helps to automate the startup. The xterm on the last line is there simply to make sure that your X session doesn’t crash if IceWM does (should never happen). You can restart IceWM from there or start some other window manager. The session will close if you close the xterm. After initialization icewm-session will search the resource path for a startup script. If this file is found and if it is executable icewm-session will run this script. During termination of icewm-session the shutdown script is executed. On termination the shutdown script will be run first, then icewm-session will terminate icewm and icewmbg. Hint: icewm-session is meant for easy desktop initialization and it is part of IceWM due to popular demand. For more sophisticated session management one could use a real session manager. IceWM supports the XSESSION protocol. Please note that if icewm-session is used as the only startup mechanism (without having .xsession involved), one can write additional environment settings into the file $HOME/.icewm/env. Expansion of simple shell style variables should be supported on most platforms. Shell command expansion is supported if wordexp was configured. This extra environment is only effective in applications started by icewm-session and their subprocesses. Exactly like Win95, OS/2 Warp. When window is clicked with a mouse, it is raised and activated. Window is raised and focused when titlebar or frame border is clicked. Window is focused but not raised when window interior is clicked. When the mouse is moved, focus is set to window under a mouse. It should be possible to change focus with the keyboard when mouse is not moved. When a window is clicked, it is activated, but not raised. New windows do not automatically get the focus unless they are transient windows for the active window. Detailed configuration is possible using the configuration file options. Select and raise the window. On the window frame, resize the window. When dragged, moves the window. When clicked, displays the context menu. The Ctrl key can be used together with a mouse button to prevent a window from being raised to the top of the stack. Activate the workspace with the window and raise the window. Toggles the minimized/active state of the window. Move window to current workspace. This only works when windows from all workspaces are shown on the taskbar all the time. Toggle raised/lowered state of the window. Add the window to the current workspace. The Alt key is assumed to be the key defined as the Mod1 modifier. Make a window occupy all desktops. Lower the window to the bottom of the stack. Restore the window state if maximized or minimized/hidden. Starts movement of the active window. Move the window either by the mouse or by the arrow keys. The arrow keys can be accelerated four times by the Shift key or sixteen times by the Control key. Press the left button or the Enter key when done. To cancel press Escape. Starts resizing of the active window. Resize the window either by the mouse or by the arrow keys. The arrow keys can be accelerated four times by the Shift key or sixteen times by the Control key. Press the left button or the Enter key when done. To cancel press Escape. Minimize the window to taskbar. Maximize the window vertically (toggle). Hide the window (appears in window list, but not on taskbar). Show the system-menu of the window. Switch between windows (top -> bottom). Switch between windows (bottom <- top). Switch to the previous workspace (cycle). Switch to the next workspace (cycle). Switch to the previously active workspace. Move the focused window to the previous workspace and activate it. Move the focused window to the next workspace and activate it. Move the focused window to the previously active workspace and activate it. Activate the AddressBar. This is a command line in the taskbar where a shell command can be typed. Pressing the Enter key will execute the command. If AddressBarCommand was configured it will be used to execute the command otherwise /bin/sh is used. If the Control key was also pressed then the command is executed in a terminal as given by TerminalCommand. The address bar maintains a history which is navigable by the Up and Down keys. A rich set of editing operations is supported, including cut-/copy-/paste-operations and file completion using Tab or Ctrl-I. $ICEWM_PRIVCFG; $XDG_CONFIG_HOME/icewm; $HOME/.icewm The first of these which is defined and existent is used to search for the user’s personal customization. The directories are searched in the above order, so any file located in the system/install directory can be overridden by the user by creating the same directory hierarchy under $HOME/.icewm. To customize icewm yourself, you could create the $HOME/.icewm directory and copy the files that you wish to modify, like preferences, keys or winoptions, from /etc/icewm, /usr/share/icewm or /usr/local/share/icewm and then modify as you like. To customize the default themes, create the $HOME/.icewm/themes directory and copy all the theme files there and then modify as necessary. Each theme has its own subdirectory. Themes can be downloaded from https://themes.ice-wm.org. Settings that should override the themes. Menu of startable applications. Usually customized by the user. Automatically generated menu of startable applications (this should be used for wmconfig, menu or similar packages, perhaps as a part of the login or X startup sequence). Quick launch application icons on the taskbar. The theme file contains the currently selected theme. It will be overwritten automatically when a theme is selected from the Themes menu. This section shows preferences that can be set in preferences. Themes will not be able to override these settings. Default values are shown following the equal sign. The following settings can be set to value 1 (enabled) or value 0 (disabled). Enables click to focus mode. Window is raised when focused. Window is focused when client area is clicked. Window is raised when client area is clicked. Window is raised when titlebar is clicked. Window is raised when title bar button is clicked. Window is raised when frame is clicked. Lower the active window when clicked again. The click which raises the window is also passed to the client. Change to the workspace of newly focused windows. Windows will raise automatically after AutoRaiseDelay when focused. When focus follows mouse always give the focus to the window under mouse pointer - Even when no mouse motion has occured. Using this is not recommended. Please prefer to use just ClickToFocus=0. Window is focused after being mapped. Transient window is focused after being mapped. Focus dialog window when initially mapped only if parent frame focused. The window is focused when application raises it. Request focus (flashing in taskbar) when application requests raise. Put new windows on top even if not focusing them. Don’t rotate the cursor for popup menus. Limit size of windows to screen. Limit position of windows to screen. Let the Dock layer limit the workspace (incompatible with GNOME Panel). Consider border frames when maximizing horizontally. Consider border frames when maximizing vertically. Consider XSizeHints if frame is maximized. Center maximized windows which can’t fit the screen (like terminals). Hide window borders if window is maximized. Hide title bar when maximized. Center dialogs on owner window. Window can be resized when maximized. Window is minimized to desktop area (in addition to the taskbar). Place the mini-icons horizontal instead of vertical. Place new mini-icons from right to left. Place new mini-icons from bottom to top. Manage root window (EXPERIMENTAL - normally enabled!). Move/resize status window is visible when moving/resizing the window. Show name of current workspace while switching. Show name of current workspace while switching workspaces. Show name of current workspace after explicit activation. Pointer is moved in pointer focus move when focus is moved using the keyboard. Window is immediately moved when dragged, no outline is shown. Window is immediately resized when dragged, no outline is shown. Similar to delayed auto raise. Makes 3 additional keys perform sensible functions. The keys must be mapped to MetaL,MetaR and Menu. The left one will activate the start menu and the right one will display the window list. Treat Super/Win modifier as Ctrl+Alt. Show popup menus above mouse pointer. Send the clicks outside menus to target window. Windows must be placed manually by the user. Smart window placement (minimal overlap). Ignore no-accept-focus hint set by some windows. If enabled, menus will track the mouse even when no mouse button is pressed. Allow mouse actions on client windows. Snap to nearest screen edge/window when moving windows. Automatically arrange windows when screen size changes. Resistance to move window with mouse outside screen limits. Setting it to 10000 makes the resistance infinite. Allow to switch a window to fullscreen. Span over all available screens if window goes into fullscreen. NET_WORKAREA behaviour: 0 (single/multimonitor with STRUT information, like metacity), 1 (always full desktop), 2 (singlemonitor with STRUT, multimonitor without STRUT). Overrides automatic multiple byte detection. Don’t cut client windows by shapes set trough frame corner pixmap. Use double buffering when redrawing the display. Favor *Xft fonts over core X11 fonts where possible. Command to run on mailbox. WM_CLASS to allow runonce for MailCommand. LockCommand = Command to lock display/screensaver. Command to run on clock. WM_CLASS to allow runonce for ClockCommand. RunCommand = Command to select and run a program. OpenCommand = Command to run to open a file. Terminal emulator must accept -e option. LogoutCommand = Command to start logout. LogoutCancelCommand = Command to cancel logout. ShutdownCommand = Command to shutdown the system. RebootCommand = Command to reboot the system. SuspendCommand = Command to send the system to standby mode. CPUStatusCommand = Command to run on CPU status. WM_CLASS to allow runonce for CPUStatusCommand. Combine all CPUs to one. NetStatusCommand = Command to run on Net status. WM_CLASS to allow runonce for NetStatusCommand. AddressBarCommand = Command to run for address bar entries. XRRPrimaryScreenName = screen/output name of the primary screen. Alt+Tab switches to minimized windows too. Priorize Alt+Tab to urgent windows. Alt+Tab switches to windows on any workspace. Alt+Tab: group windows on current workspace. Show all reachable icons when quick switching. Show the window title above (all reachable) icons. Go through all window titles and choose width of the longest one. Place the icons and titles vertical instead of horizontal. Show the huge (48x48) of the window icon for the active window. Fill the rectangle highlighting the current icon. Workspace switches by moving mouse to left/right screen edge. Workspace switches by moving mouse to top/bottom screen edge. Workspace switches continuously when moving mouse to screen edge. Task bar is located at top of screen. Task bar will auto hide when mouse leaves it. Auto show task bar when fullscreen window active. Task bar clock is visible. Show APM/ACPI/Battery/Power status monitor on task bar. Enable TaskBarShowAPMStatus if a battery is present. Show APM status on task bar in time-format. Show APM status in graph mode. Display status of mailbox (see ‘Mailbox’ below). Beep when new mail arrives. Display mail message count as tooltip. Show workspace switching buttons on task bar. Show windows on the taskbar. Show ‘show desktop’ button on taskbar. Show Ellipsis in taskbar items. Show windows in the tray. Show windows from all workspaces on tray. Enable the system tray in the taskbar. Show transient (dialogs, …) windows on task bar. Show windows from all workspaces on task bar. Show icons of windows on the task bar. Show button for the start menu on the task bar. Show button for window list menu on taskbar. Show CPU status on task bar (Linux & Solaris). Show RAM usage in CPU status tool tip. Show swap usage in CPU status tool tip. Show ACPI temperature in CPU status tool tip. Show ACPI temperature in CPU graph. AcpiIgnoreBatteries = List of battery names ignore. Show CPU frequency in CPU status tool tip. Show memory usage status on task bar (Linux only). Show network status on task bar (Linux only). NetworkStatusDevice = "[ew]*" List of network devices to be displayed in tray, space separated. Shell wildcard patterns can also be used. Show a button to collapse the taskbar. Place workspace pager on left, not right. Place workspace pager on top row when using dual-height taskbar. Show a mini desktop preview on each workspace button. By pressing the middle mouse button the ‘window list’ is shown. The right button activates the ‘window list menu’. By using the scroll wheel over the ‘workspace list’ one can quickly cycle over all workspaces. Draw window icons inside large enough preview windows on pager (if PagerShowPreview=1). Draw even minimized windows as unfilled rectangles (if PagerShowPreview=1). Draw border around workspace buttons (if PagerShowPreview=1). Show number of workspace on workspace button (if PagerShowPreview=1). Execute taskbar applet commands (like MailCommand, ClockCommand, …) on single click. Enable address bar functionality in taskbar. Show address bar in task bar. format for the taskbar clock (time) (see strftime(3) manpage). Alternate Clock Time format (e.g. for blinking effects). format for the taskbar clock tooltip (date+time) (see strftime(3) manpage). Default number of tasks in taskbar. Task bar width as percentage of the screen width. Taskbar justify left, right or center. Height of taskbar monitoring applets. Primary screen for xinerama (taskbar, …). Delay between new-mail checks. (seconds). To help solve network protocol errors for pop3 and imap set the environment variable ICEWM_MAILCHECK_TRACE. IceWM will then log communication details for POP3 and IMAP mailboxes. Just set export ICEWM_MAILCHECK_TRACE=1 before executing icewm, or set this in the env configuration file. ICEWM_MAILBOX mailbox index number of MailBoxPath starting from 1. ICEWM_COUNT gives the total number of messages in this mailbox. ICEWM_UNREAD gives the number of unread messages in this mailbox. Reload menu files automatically if set to 1. Show the help menu item. Show the about menu item. Show the run menu item. Show the window menu item. Maximal width of popup menus, 2/3 of the screen’s width if set to zero. Minimal number of themes after which the Themes menu becomes nested (0=disabled). Percentage of delay/timeout fuzziness to allow for merging of timer timeouts. Movement before click is interpreted as drag. Delay before click gets interpreted as drag. Time (ms) to recognize for double click. Delay before activating menu items. Delay before activating menu submenus. Time before showing the tooltip. Time before tooltip window is hidden (0 means never). Time to auto hide taskbar (must enable first with TaskBarAutoHide). Delay before task bar is shown. Time to auto raise (must enable first with AutoRaise). Delay for pointer focus switching. Screen edge workspace switching delay. Time before workspace status window is hidden. Delay between CPU Monitor samples in ms.
Delay between Memory Monitor samples in ms.
Delay between Net Monitor samples in ms. Number of seconds the taskbar app will blink when requesting focus (0 = forever). Taskbar blink interval (ms) when requesting focus (0 = blinking disabled). Delay between power status updates (seconds). Bitmask of root window button click to use in window manager. Bitmask of buttons that raise the window when pressed. Desktop mouse-button click to show the window list menu. Desktop mouse-button click to show the window list. Desktop mouse-button click to show the root menu. TitleBar mouse-button double click to maximize the window. TitleBar mouse-button double click to rollup the window. Path to the icewm/lib directory. Path to the icon directory. Multiple paths can be given using the colon as a separator. program to run when the clock is double clicked. program to run when mailbox icon is double clicked. program to run to lock the screen. This section shows settings that can be set in theme files. They can also be set in preferences file but themes will override the values set there. To override the theme values the settings should be set in prefoverride file. Default values are shown following the equal sign. Theme author, e-mail address, credits. Description of the theme, credits. List of gradient pixmaps in the current theme. The following settings can be set to a numeric value. Left/right border width of non-resizable windows. Top/bottom border height of non-resizable windows. Width of the window corner. Height of the window corner. Justification of the window title. Horizontal offset for the window title text. Vertical offset for the window title text. Dimension of the small icons. Dimension of the large icons. Horizontal margin of the quickswitch window. Vertical margin of the quickswitch window. Vertical margin in the quickswitch window. Distance between the active icon and it’s border. Height of the separator between (all reachable) icons and text, 0 to avoid it. Show application icon over menu button. Titlebar buttons from left to right (x=close, m=max, i=min, h=hide, r=rollup, s=sysmenu, d=depth). Titlebar buttons from right to left (x=close, m=max, i=min, h=hide, r=rollup, s=sysmenu, d=depth). Titlebar buttons supported by theme (x,m,i,r,h,s,d). The following settings can be set to a string value. Name of the title bar font. Name of the menu font. Name of the status display font. Name of the font for Alt+Tab switcher window. Name of the normal button font. Name of the active button font. Name of the normal task bar item font. Name of the active task bar item font. Name of the tool button font (fallback: NormalButtonFontName). Name of the normal workspace button font (fallback: NormalButtonFontName). Name of the active workspace button font (fallback: ActiveButtonFontName). Name of the mini-window font. Name of the window list font. Name of the tool tip font. Name of the task bar clock font. Name of the task bar temperature font. Name of the task bar battery font. Name of the input field font. Name of the label font. Name of the tool button font (fallback: NormalButtonFontNameXft). Name of the normal workspace button font (fallback: NormalButtonFontNameXft). Name of the active workspace button font (fallback: ActiveButtonFontNameXft). Background of toolbar buttons, ColorNormalButton is used if empty. Textcolor of toolbar buttons, ColorNormalButtonText is used if empty. Background of workspace buttons, ColorNormalButton is used if empty. Textcolor of workspace buttons, ColorNormalButtonText is used if empty. Background of the active workspace button, ColorActiveButton is used if empty. Textcolor of the active workspace button, ColorActiveButtonText is used if empty. Background of the titlebar of regular windows. Textcolor of the titlebar of regular windows. Textshadow of the titlebar of regular windows. Background of the titlebar of active windows. Textcolor of the titlebar of active windows. Textshadow of the titlebar of active windows. Background for mini icons of regular windows. Textcolor for mini icons of regular windows. Background for mini icons of active windows. Textcolor for mini icons of active windows. Textcolor of regular menu items. Background of selected menu item, leave empty to force transparency. Textcolor of selected menu items. Textcolor of disabled menu items. Shadow of regular menu items. Background of move/resize status window. Textcolor of move/resize status window. Background of the quick switch window. Textcolor in the quick switch window. Rectangle arround the active icon in the quick switch window. Background for task buttons of regular windows. Textcolor for task buttons of regular windows. Background for task buttons of the active window. Textcolor for task buttons of the active window. Background for task buttons of minimized windows. Textcolor for task buttons of minimized windows. Background for task buttons of windows on other workspaces. Textcolor for task buttons of windows on other workspaces. Background of the slider button in scrollbars. Background of the arrow buttons in scrollbars. Background of the arrow buttons in scrollbars (obsolete). Color of active arrows on scrollbar buttons. Color of inactive arrows on scrollbar buttons. Background of selected listbox items. Textcolor of selected listbox items. Background of labels, leave empty to force transparency. Background of text entry fields (e.g. the addressbar). Textcolor of text entry fields (e.g. the addressbar). Background of selected text in an entry field. Selected text in an entry field. Background of non-LCD clock, leave empty to force transparency. Background of APM monitor, leave empty to force transparency. Color of APM monitor in battary mode. Color of APM monitor in line mode. Background color for graph mode. User load on the CPU monitor. System load on the CPU monitor. Interrupts on the CPU monitor. IO Wait on the CPU monitor. Soft Interrupts on the CPU monitor. Nice load on the CPU monitor. Idle (non) load on the CPU monitor, leave empty to force transparency. Involuntary Wait on the CPU monitor. User program usage in the memory monitor. OS buffers usage in the memory monitor. OS cached usage in the memory monitor. Free memory in the memory monitor. Outgoing load on the network monitor. Incoming load on the network monitor. Idle (non) load on the network monitor, leave empty to force transparency. Color of APM monitor in battery mode. Display desktop background centered and not tiled. (set to 0 or 1). Resize desktop background to full screen. Color(s) of the desktop background. Image(s) for desktop background. If you want IceWM to ignore the desktop background image / color set both DesktopBackgroundColor and DesktopBackgroundImage to an empty value (“”). Support for semitransparent terminals like Eterm or gnome-terminal. Color(s) to announce for semitransparent windows. Image(s) to announce for semitransparent windows. Paint the background image over all multihead monitors combined. Display clock using LCD style pixmaps. Within the menu configuration file you can configure which programs are to appear in the root/start menu. Menus can be populated with submenus and with program entries as explained below for the program configuration file. Comments start with a #-sign. The menufile directive creates a submenu with a title and an icon, while menuprog and menuprogreload create a submenu with entries from the output of program arguments where the timeout of menuprogreload says to reload the submenu after the timeout expires. The include statement loads more configuration from the given filename, while includeprog runs program arguments to parse the output. The toolbar configuration file is used to put programs as buttons on the taskbar. It uses the same syntax as the menu file. Usually automatically generated menu configuration file of installed programs. The programs file should be automatically generated by wmconfig (Redhat), menu (Debian), or icewm-menu-fdo. icon_name can be - if icon is not wanted, or ! if the icon name shall be guessed by checking the command (i.e. the real executable file, following symlinks as needed). Submenus can be added using the same keywords as the menu configuration file. Only double quotes are interpreted by IceWM. IceWM doesn’t run the shell automatically, so you may have to do that. It’s possible that an application’s name and/or class contains a dot character (. ), which is also used by IceWM to separate name, class and role values. In this case precede the dot with the backslash character. In the following example, we suppose an application’s window has the.name as its name value and The.Class as its class value and for this combination we set option to argument. The name of the icon. Desktop Desktop window. There should be only one window in this layer. Normal Default layer for the windows. Dock Layer for windows docked to the edge of the screen. AboveDock Layer for the windows above the dock. Menu Layer for the windows above the dock. You can also use a number from 0 to 15. Ignore Don’t add an icon to the tray pane. Minimized Add an icon the the tray. Remove the task pane button when minimized. Exclusive Add an icon the the tray. Never create a task pane button. The sorting order of task buttons and tray icons. The default value is zero. Increasing positive values go farther right, while decreasing negative values go farther left. The order option applies to the task pane, the tray pane and the system tray. If set to 1, window will be visible on all workspaces. if set to 1, IceWM will assume the window supports the WM_TAKE_FOCUS protocol even if the window did not advertise that it does. If set to 0, window will not have a border. If set to 0, window will not have a close button. If set to 0, window will not have a maximize button. If set to 0, window will not have a minimize button. If set to 0, window will not have a resize border. If set to 0, window will not have a system menu. If set to 0, window will not have a title bar. if set to 1, this window will limit the workspace available for regular applications. At the moment the window has to be sticky to make it work. if set to 1, IceWM will never give focus to the window. If set to 0, window will not be closable. If set to 0, window will not be hidable. If set to 0, window will not be maximizable. If set to 0, window will not be minimizable. If set to 0, window will not be movable. If set to 0, window will not be resizable. If set to 0, window will not be shadable. if set to 1 and the application had not registered WM_DELETE_WINDOW, a close confirmation dialog won’t be offered upon closing the window. If set to 1, the window manager leave more keys (Alt+F?) to the application. if set to 1, IceWM will focus even if the window does not handle input. If set to 1, window will not appear in pager preview. if set to 1, IceWM will ignore the position hint. If set to 1, window will not be accessible using QuickSwitch feature (Alt+Tab). If set to 1, window will not appear on the task bar. if set to 1, IceWM will ignore it if the window sets the urgent hint. If set to 1, window will not appear in the window list. if set to 1, window will not automatically get focus as application raises it. if set to 1, IceWM will not assign focus when the window is mapped for the first time. if set to 1, IceWM assumes the application does not support the ICCCM standard wrt positioning and compensate for that. if set to 1, window will cover the entire screen. if set to 1, window starts maximized. if set to 1, window starts maximized horizontally. if set to 1, window starts maximized vertically. if set to 1, window starts minimized. Other pixmap sizes like 20x20, 24x24, 40x40, 48x48, 64x64 might be used in the future. Perhaps we need a file format that can contain more than one image (with different sizes and color depths) like Windows’95 and OS/2 .ICO files. A PPM icon in your IconPath. An PNG image with absolute location. Default cursor (usually pointer to the left). Menu cursor (usually pointer to the right). Cursor when you resize the window by top left. Cursor when you resize the window by top. Cursor when you resize the window by top right. Cursor when you resize the window by left. Cursor when you resize the window by right. Cursor when you resize the window by bottom left. Cursor when you resize the window by bottom. Cursor when you resize the window by bottom right. Themes are used to configure the way the window manager looks. Things like fonts, colors, border sizes, button pixmaps can be configured. Put together they form a theme. Theme files are searched in the themes subdirectories. Name of the theme to use. Both the directory and theme file name must be specified. If the theme directory contains a file named fonts.dir created by mkfontdir the theme directory is inserted into the X servers font search path. www.box-look.org has a very large number of themes which were created by users of IceWM. NAME of the X server to use. Client id to use when contacting session manager. Print preferences after all processing. Prints this usage screen and exits. Tell the running icewm to restart itself. Print the compile time configuration. Print a list of all available themes. The theme name will then be saved to the ‘theme’ configuration file, before restarting IceWM. Resource Path A set of directories used by IceWM to locate resources like configuration files, themes, icons. See section The Resource Path. Authors having contributed to this document include Gallium, Macek, Hasselmann, Gijsbers, Bidulock and Bloch. icehelp(1), icesh(1), icesound(1), icewm-env(5), icewm-focus_mode(5), icewm-keys(5), icewm-menu-fdo(1), icewm-menu(5), icewm-preferences(5), icewm-prefoverride(5), icewm-programs(5), icewm-session(1), icewm-set-gnomewm(1), icewm-shutdown(5), icewm-startup(5), icewm-theme(5), icewm-toolbar(5), icewm-winoptions(5), icewm(1), icewmbg(1), icewmhint(1), icewmtray(1).